A large-format, full-color illustrated book on Alexander Mack, the founder of the Brethren Church movement, is available for those who would like to know more of Brethren history or make an important addition to a church library. The book, Alexander Mack: A Man Who Rippled the Waters, is written by Myrna Grove of Bryan, Ohio. It was was well received among churches at the joint annual conference of the Church of the Brethren and the Brethren Church last summer in Richmond, VA, and at the 300th anniversary celebration of the founding of the Brethren movement in Schwarzenau, Germany last August. While the book specifically targets children, feedback shows that adults are inspired by Alexander Mack and learn much from his witness in the book, as well. Features of this anniversary edition hardback of Alexander Mack: A Man Who Rippled the Waters are as follows. It measures 9″ x 11″ in size, is 60 pages in length, and features more than 50 full color oil paintings researched on location in Germany and America by a professional artist. The book recounts the life of Alexander and Anna Mack with accuracy and grace. Additional pages include: The Brethren denominations, a timeline of Alexander Mack’s life events, a map with critical locations marked, a bibliography and sourcebook list for adults, text notes, and pages about the author and illustrator, both of whom have strong Brethren backgrounds. The artist is an eighth-generation descendant of Alexander Mack. She was hosted in Germany by Otto Marburger, Schwarzenau’s official historian, in the fall of 2007 at which time they authenticated both research and illustrations before the book went to press. The book retails for $22 each, plus shipping. For more information, or to obtain the book, log onto www.mgrovebooks.com or contact the author at Graf24@cityofbryan.net or phone (419) 636-3550. 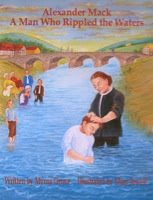 "Alexander Mack: A Man Who Rippled the Waters" is a worthy account of the history of the Church of the Brethren and its beginnings in Schwarzenau, Germany. Myrna Grove in Bryan, Ohio, is a much respected school teacher. Her detailed research in church history is heralded in her excellent scholarship in this book. The artist, Mary Jewell, is a well-traveled scholar in her own right. She traveled to Germany to paint the illustrations for this book in the locations where Alexander Mack and the Church of the Brethren's beginnings took place. I highly recommend this book for its authenticity and, also, for its scholarship. Curing the last 300 years, the Church of the Brethren has spread the Gospel message of peace and goodwill because of the sacrifice and example of Alexander Mack, the church's founder.